Big Reveal #2 & we had our minds blown! It was time to head back over to my grandparents to check on them again after all the hurricane Matthew mayhem. When James and I arrived, Grandpa was still sleeping in his bed so we sat in the living room with Grandma to chat for a bit, while keeping Grandpa in clear view. Eventually, Grandpa woke up to our voices and we noticed his hand waving hello to us. I beamed at him and went right over to greet him with a hug and a kiss. If you haven’t figured out by now, I’m a total Grandpa’s girl. No shame. Grandma had told us he had been sleeping even more lately and had slept through the entirety of Hurricane Matthew to the point where he didn’t even realize we had one. 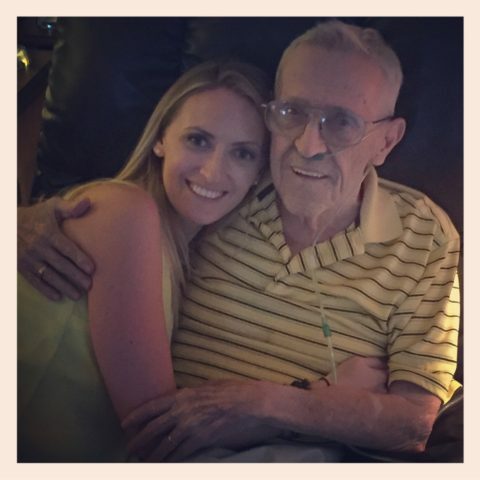 We thought he was having another decline, but we later learned that Grandpa had yet another battle with pneumonia, which put him back in a hospice hospital until he pulled through, but that’s another story and Grandpa was awake and happy to see his “baby girl”. I stayed on his hospital bed with him for the remainder of the visit. It was just he and I having one on one time, while James and Grandma were having one on one time as well. Grandma was telling James stories of me as a little girl and my bond with Grandpa, etc. while they looked on and saw the bond for themselves, as they have countless times before. While I am sitting with Grandpa while he laid down, weak, tired and unable to find the strength to get out of bed, he made sure he found the strength to tell me how much he loved me. Every now and again, when in his weakest times, he gets a bit more sentimental than usual with me. For a man that battles with both Alzheimer’s and Dementia, he remembers memories of me as a child rather vividly still and I could not be more appreciative and lucky to still be able to share those moments with him. He started telling me stories and it didn’t take long before he was reminding me of my summers spent in Swannanoa, North Carolina with him and Grandma at the local KOA. They had a fifth wheel that they would take there every summer, I looked forward to running around that campground, playing, fishing, making new friends and seeing friends I’ve made all the summers before and especially seeing all “my” ducks. Grandpa went on and on and we both would just smile and tear up with everything he recalled. Those were great times we shared there. Then, Grandpa said something to me that took me completely by surprise. Grandpa said I needed to go back to North Carolina. I smiled and told him that James and I were about to leave for North Carolina in a couple of weeks. He gave me the biggest smile and asked if we were going up there in a motorhome and my mouth dropped. Before I could really even conjure up a reply, Grandpa was holding onto my hands even tighter and telling me that James and I need to buy an RV and travel the country together. SERIOUSLY. I cannot even put into words how I felt in that moment. It was then that Grandma interrupted and said it was time for us to go and let Grandpa rest – she had no idea what had been said. We said our goodbyes and while still in their driveway, I blurted out to James what had just happened and told him that we needed to show Grandpa the RV right now. There was no more waiting, they were safe, their home was safe and now it was time to show them. So we drove back to his family’s and picked it up and he followed me back there while I drove the Jeep. Now, during this relatively short drive between homes, it felt like eternity because I repeatedly called Grandma so I could ask her to do me a favor. I can’t even remember how many times it took before she finally picked up, but we weren’t too far away by the time she did. When Grandma answered my call she sarcastically exclaimed “DON’T YOU HAVE A HOME TO GO HOME TO? !” as she was engrossed with reruns of The Golden Girls. I asked her “Grandma, I need you to do me a huge favor. Please get Grandpa dressed and in his wheelchair so he can be wheeled outside.” She paused and said she wasn’t sure and if she did, she wouldn’t be able to take him very far, but I told her it was important and all I needed was for him to get to the front gate of the patio and she agreed. It didn’t take her too long either. You tell her you have a surprise and the impatience sets in immediately. I pulled up first in the Jeep and she was ready and waiting with the porch gate wide open and Grandpa in his wheelchair. I was excited as ever. She saw me pull up and said “Did you get a new car? !” and before she could fully process that, she saw a large “truck” as she called it in the moment backing in. Confused, she started to ask what it was that was backing in and then she saw James behind the wheel and her mouth dropped and the shock and excitement escalated from that point on. Needless to say, it was another VERY special day for us all and an outstanding time full of surprise, love and support for our new journey ahead. We could not have been happier as we left our family safe, happy and with plenty to chat about. 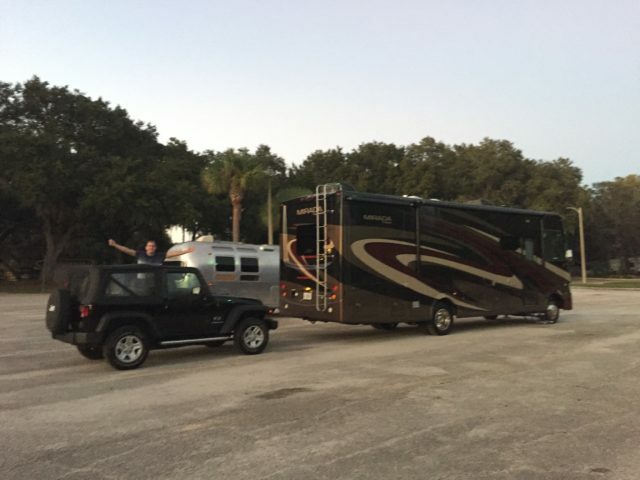 We made our way back to Orlando and set up the RV in a local campground while we prepared to move into it and for our maiden voyage to North Carolina. Just a wee blurry… excitement will do that.